TUSCALOOSA, Ala. – University of Alabama senior Rob Davis has been selected as one of three 2003 Portz Scholars in the National Collegiate Honors Council’s competition for outstanding undergraduate Honors papers, a first for any UA student. Davis, a member of the University Honors Program and Computer Based Honors Program majoring in aerospace engineering, was the principal author of a paper titled “Mass Loss and Blunting During High-Speed Penetration” based on research done at UA with Amanda Neely, a junior in aerospace engineering, and Dr. Stanley Jones, Cudworth Professor of Aerospace Engineering and Mechanics. “This is a tremendous honor for me and the University. It’s very rare for the NCHC to recognize engineering papers, which makes it even more meaningful,” said Davis. Each NCHC institution can nominate one paper written by an undergraduate honors student for the Portz Scholars competition. Dr. Robert Halli Jr., director of the University Honors Program, chose to nominate Davis because he has been an outstanding student leader representing the University Honors Program and he has excelled in his major field. Davis was selected to participate in this past summer’s NASA Undergraduate Student Research Program at the Marshall Space Flight Center in Huntsville, and he received the 2003 American Institute of Aeronautics and Astronautics (UA chapter) Outstanding Senior Award. 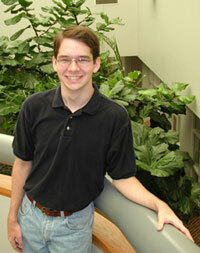 Davis worked as an undergraduate research assistant for Jones on a project sponsored by the U.S. Air Force, and he is currently working with Drs. Michael Polites and Semih Olcmen, both associate professors of aerospace engineering and mechanics, on a joint project of UA and NASA. Davis is a resident of Montgomery. Davis will present a 20-minute summary of his paper at the national conference of the NCHC in Chicago on Nov. 8. The NCHC, established in 1966, is the coordinating body of all the nation’s honors programs and colleges. The Portz Fund is named in honor of John and Edythe Portz. Dr. John Portz was the first director of the University Honors Program at the University of Maryland, College Park, and one of the founders of the NCHC, serving as one of its first presidents. The University Honors Program offers qualified undergraduate students a special academic challenge. Honors classes have limited enrollment, placing emphasis on interaction between students and faculty. The University Honors Program does not constitute a major or minor, allowing students to pursue both an honors education and a degree in their chosen area of study. In 1837, The University of Alabama became the first university in the state to offer engineering classes and was one of the first five in the nation to do so. Today, the College of Engineering has about 1,900 students and more than 90 faculty. It has been fully accredited since accreditation standards were implemented in the 1930s.